Chef Zane Holmquist’s roasted carrots. At Montage Deer Valley's Apex restaurant, a gaggle of talented chefs from Deer Valley eateries and beyond huddled recently to create their annual Harvest Dinner. While the meal was spectacular, I don't normally write about such events—since, you know, it already happened, and you missed it. However, you can enjoy these great chefs' cooking at their individual restaurants, and this feast was a peek into what you might expect. One thing I can guarantee: Plan to be dazzled. The evening began with a cocktail reception and hors d'oeuvres, where guests met and mingled with chefs and the purveyors of artisan food, such as Gold Creek Farms, The Honey Jar and Strong Vertical Gardens. Montage Deer Valley Executive Chef Shawn Armstrong led off with his creative beet-root deviled egg—a hollowed-out, fuchsia-colored egg white stuffed with speck and pickled mustard seeds. This wasn't your momma's deviled egg. Armstrong's innovative handling of something as traditional as a deviled egg makes me want to try the scallop BLT on the regular Apex menu. Stein Eriksen Lodge Chef Zane Holmquist took the reins for the next course, an autumnal dish of roasted fall carrots with garam masala glaze, atop faro "grits" with Gold Creek Farms cheddar. 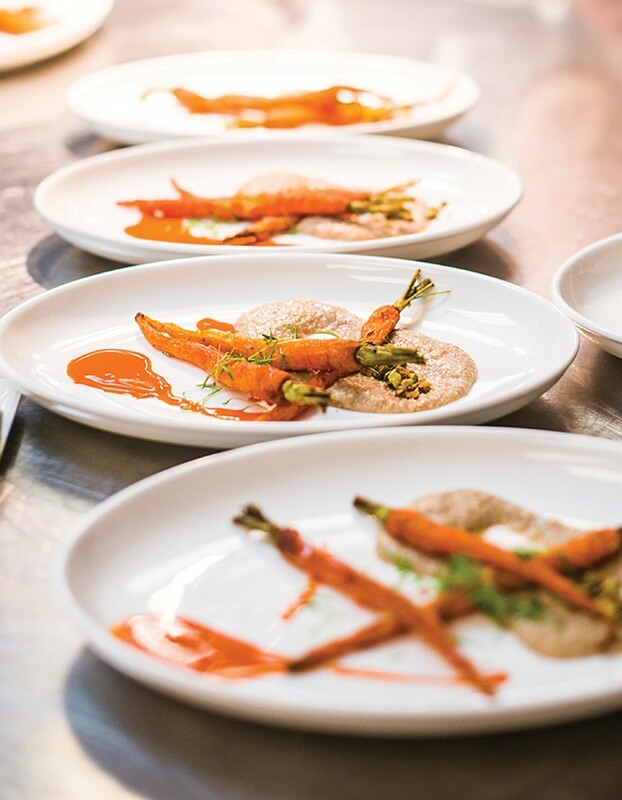 The Indian flavor slant, via the garam masala glaze, made me see and taste carrots in a whole new light, providing a truly delicious interpretation of the humble root vegetable. Served on a stone plate—I wouldn't want to be a server that night!—Ryker Brown's Utah rainbow trout was sensational. Brown is a chef I've been keeping an eye on for some time. His talents appear to be limitless, and the fall flavors of his seared trout with pork belly, braised cabbage, apples, mustard and mussels are testament to his creativity. I'm not sure I'd want to leave that diverse collection of ingredients in anyone else's hands. To sample Chef Brown's cooking yourself, I suggest visiting The Peak restaurant at Promontory for his blackened ahi tuna with buckwheat pasta, pea tendrils and pineapple-soy ponzu sauce. Not to be outdone, Rachel Wiener, executive sous and chef de cuisine at St. Regis Deer Valley, wowed the crowd with her Niman lamb rack—beautiful, medium-rare racks with leeks, trumpet royal mushrooms and white asparagus. Weiner is a versatile chef whose J&G Grill menu at the St. Regis ranges from Sichuan pepper-crusted yellowfin tuna and pan-roasted Arctic char Grenobloise, to shiitake-shio ramen with roasted pork pancetta, soft-cooked egg, pea shoots and togarashi. Throughout the evening, excellent wines were paired with each course, and the service was about as good as it gets. The professionalism of the Apex restaurant staff is nothing short of world-class. Montage Executive Pastry Chef Stephen Jones closed the evening with a stunning, scrumptious dessert composed of dried flowers from summer persimmons with honey and white-tea ice cream—a very inventive dessert, indeed. To ensure that you don't miss the Montage's next culinary extravaganza, I recommend contacting the folks there to be put on a list to receive info about upcoming special dinners and events. In the meantime, you can enjoy the extraordinary cooking of these fine chefs at Apex, Stein Erikson, Promontory and St. Regis.